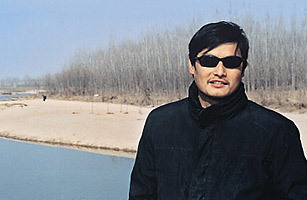 He may have lost his sight as a child, but Chen Guangcheng's legal vision has helped illuminate the plight of thousands of Chinese villagers. Last year officials initiated a forced abortion and sterilization campaign against women in Shandong province who were deemed ineligible to bear another child under China's strict family-planning policy. Even though national regulations prohibit such brutal measures, no one except Chen was willing to confront local officials, who may have felt that lowering the number of extra births would help their political careers. By filing a lawsuit on the women's behalf, he became a hero in Shandong and an important player in China's nascent civil society. "Someone has to fight for people with no voice," he said last fall. "I guess that person is me." Despite his pioneering legal efforts, Chen, 34, holds no law degree. When he was younger, the blind were prohibited from pursuing college degrees in China, so Chen could only audit law classes. But he learned enough to advise fellow villagers. Distraught citizens asked him last year if he could do anything about the coerced abortions and sterilizations. At least two women had been forced to abort their babies just days before their due dates. Chen traveled to Beijing to see what he could do. His drumbeat advocacy prompted the usually reticent State Family Planning Commission to call for the arrest of any officials who break the law. Yet three hours after meeting with TIME in Beijing to discuss the issue, Chen was shoved into an unmarked vehicle by public-security agents from his hometown. They bundled him back to his village, where he was held under house arrest for months. Despite the commission's vow, only one official has been detained. Meanwhile, thugs routinely showed up at Chen's home to rough him up. In March several dozen police arrived to take Chen away, and he hasn't been seen since. But the people of Shandong haven't forgotten the blind man who let the world see their tragedies.